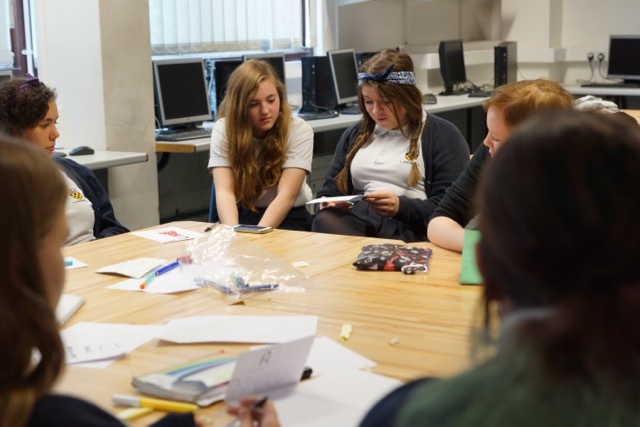 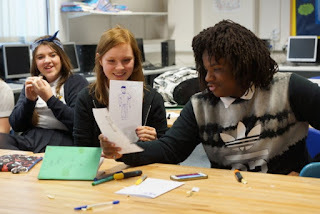 Today Jamie Wyld (Nimbus Group and project Co-Director) and Juliette Buss (Project Coordinator) and I met with the students to talk about the exhibition and gather ideas. 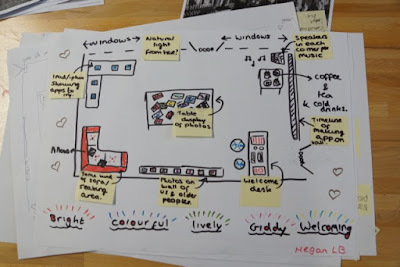 We started by asking the group what they think is involved in putting an exhibition together and what kind of material we have to use for our Giddy launch exhibition. 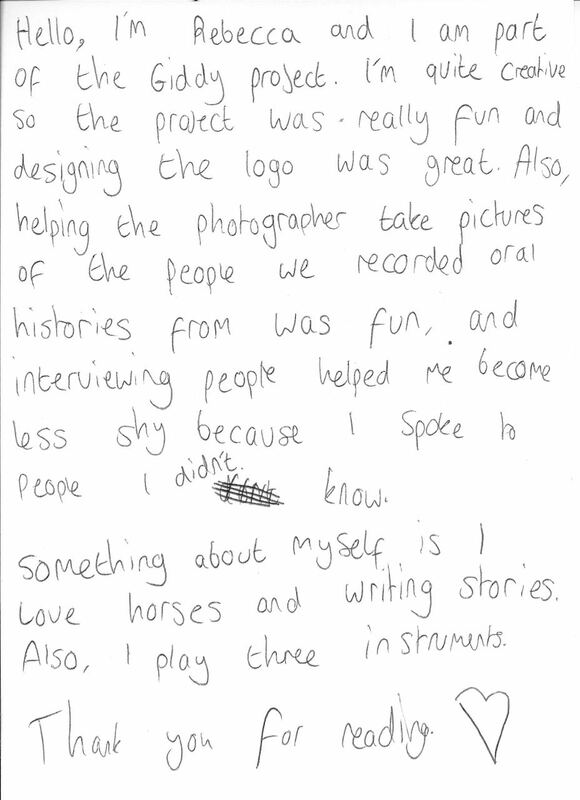 The group had loads of ideas to contribute before we'd even really introduced the idea which was fantastic. 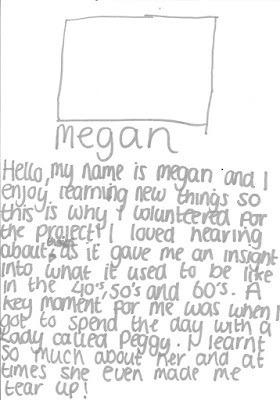 After hearing their ideas Jamie gave a brief introduction in putting an exhibition together using a case study of a previous project Past Present. The group then added more to their list of possible things to involve in the exhibition. 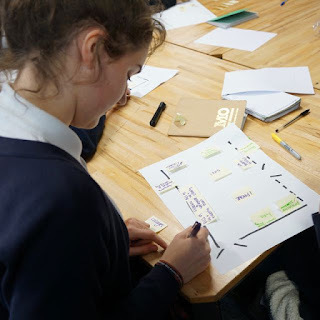 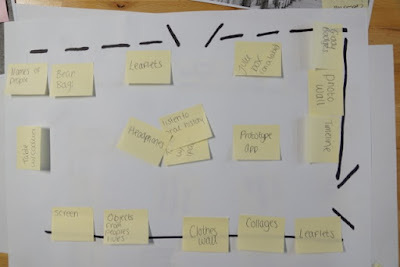 We showed the group the a plan of the exhibition space and gave each pair an A3 sheet and some mini post-it notes to create a mini exhibition plan. It was really interesting to hear the groups ideas about what was important to them about putting an exhibition together. 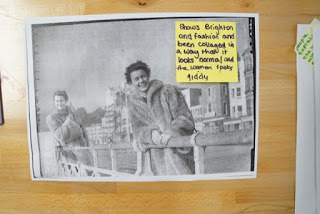 High on the list was a sense of it being accessible - in many different ways - by having gallery guides to help talk through the exhibition, to having music playing, comfortable chairs to sit on, cookies and food in general was pretty important. 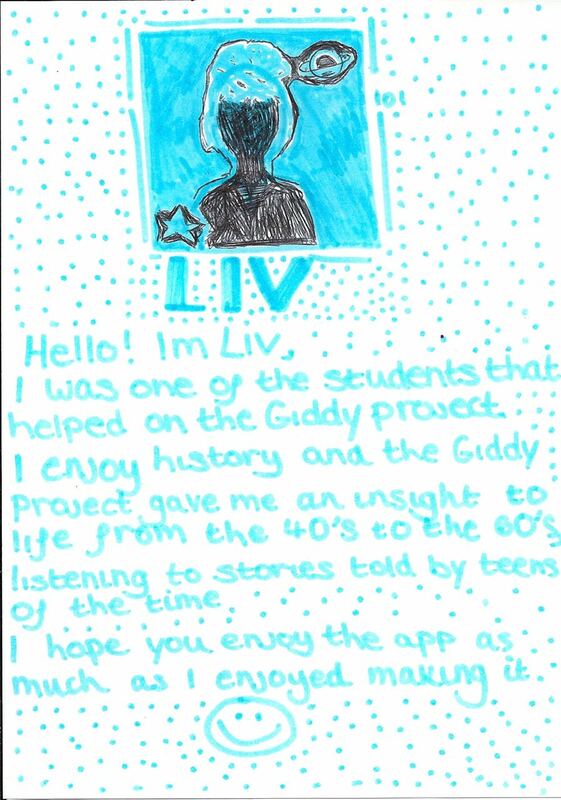 Showing the process of what had gone into making the app was key for many of them and this I felt really reflected a sense of ownership and pride in the project. 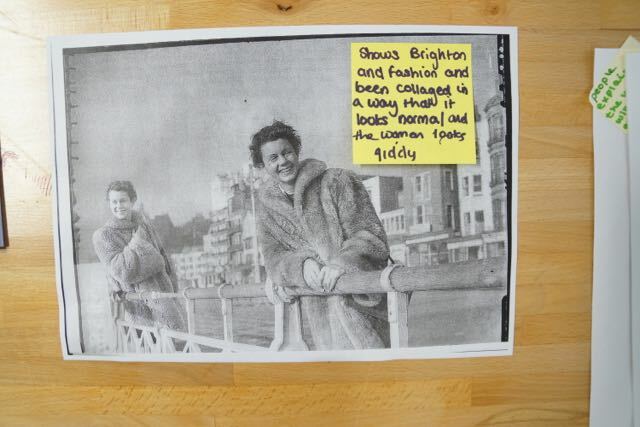 They had some really creative ideas which will definitely inform the curation of the show. 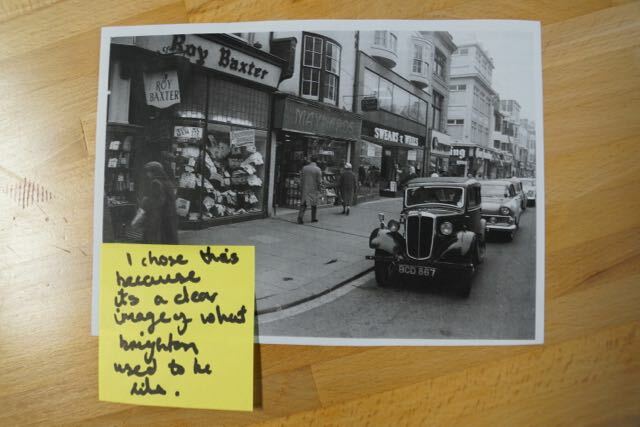 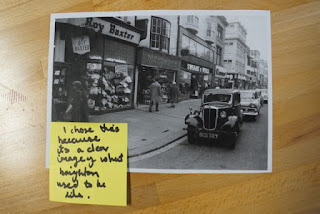 We'd printed all archive photos and collages so they could select their favourite images for the exhibition and asked them to tell us why they chose them by adding a post it note comment to them. 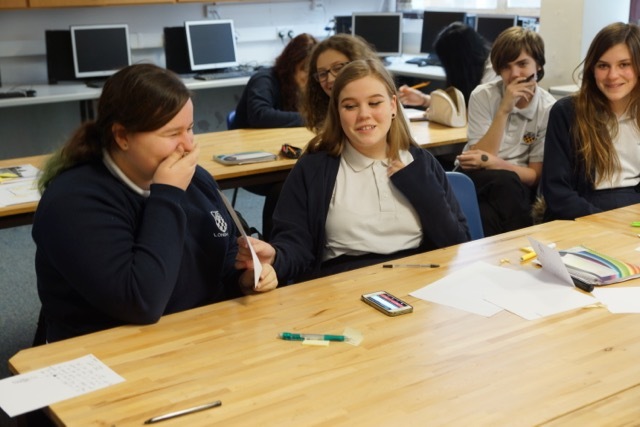 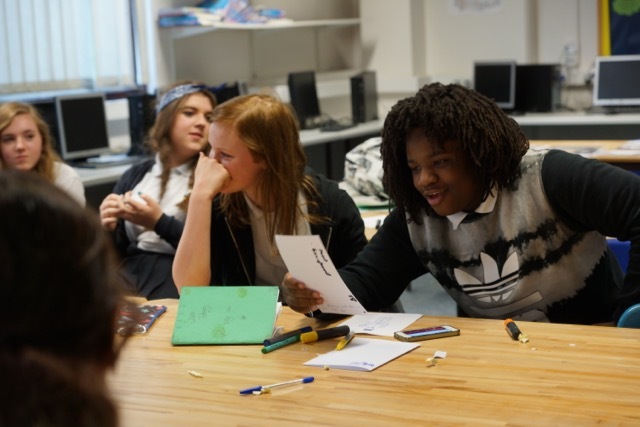 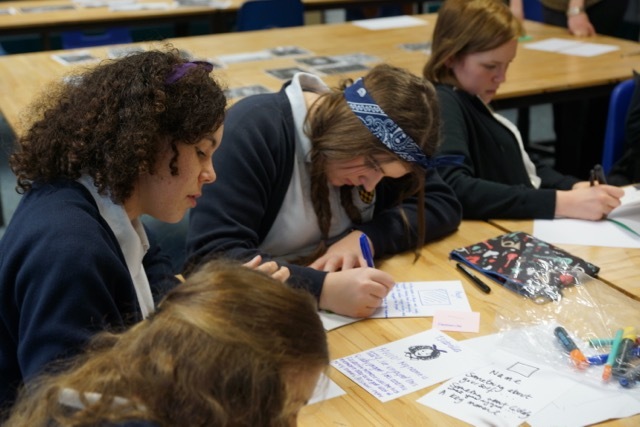 The next exercise was designed to demonstrate how much they'd learnt about what it was like to be a teenager in the 40's, 50's and 60's. 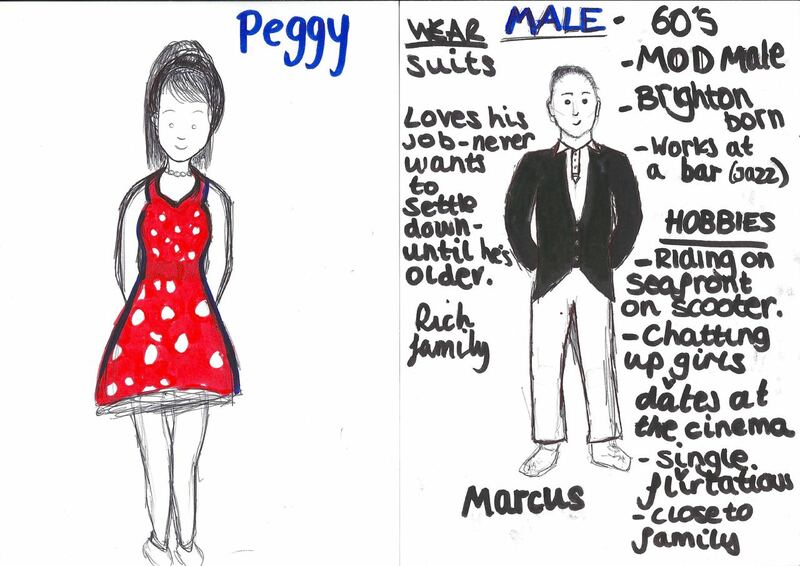 In group of 4 each group given a decade and have to come up with a male and female character and create a profile of them. One pair chooses the male character, the other, female. They can choose to either - write a diary entry as a day in the life of their character or present to the rest of the group informally or in the style of an interview. 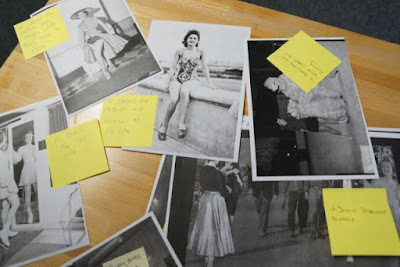 It was great to hear about the characters they'd invented and how it reflected the people they'd met and interviewed as well as the experience of visiting Brighton Museum, The Keep and looking at archive photos and Screen Archive South Easts films. 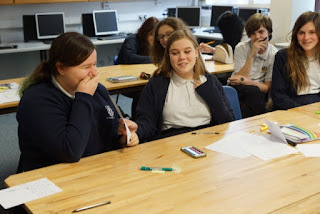 Each pair presented back their characters in different ways with good humour and great confidence! 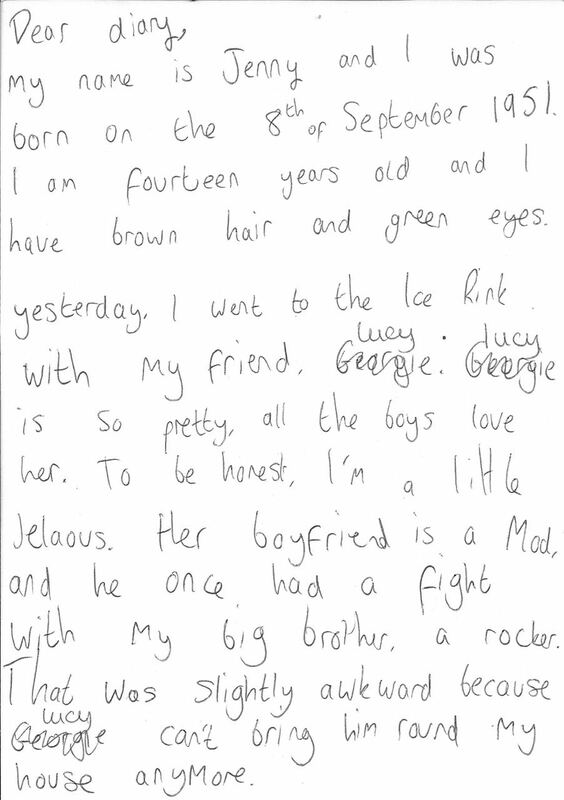 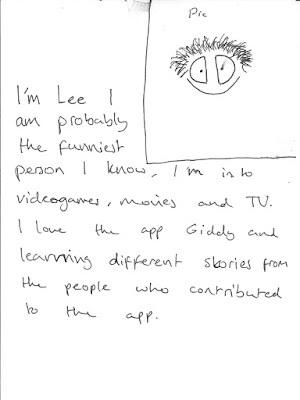 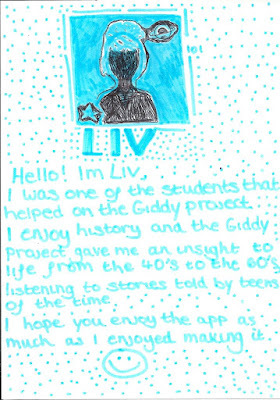 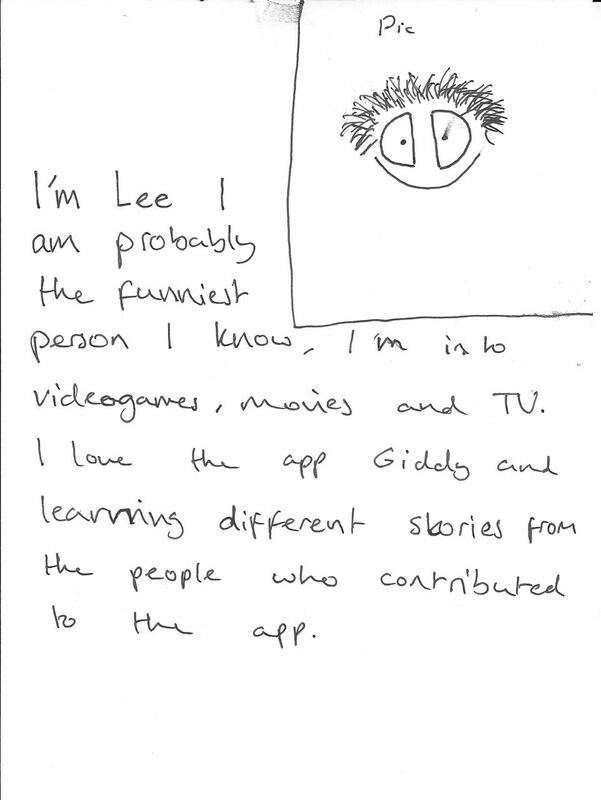 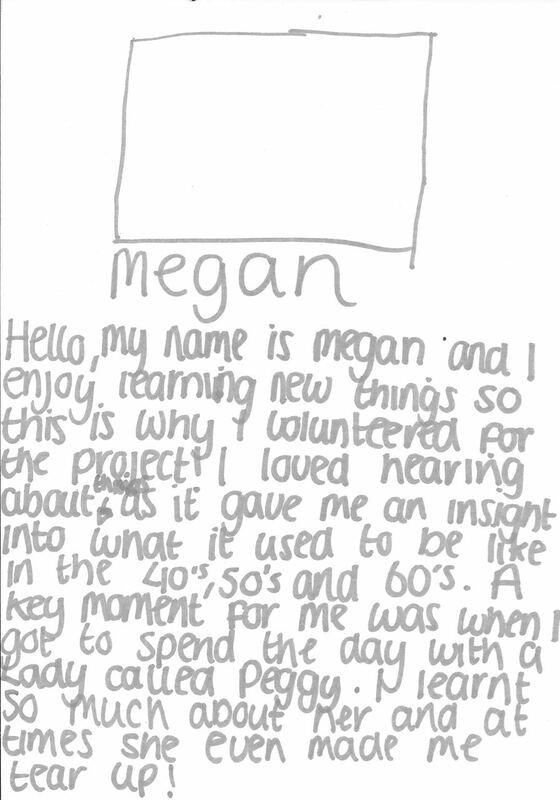 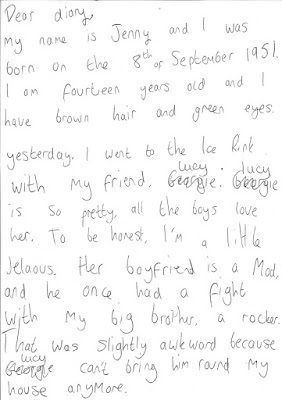 Finally the group were asked to write a short biog to go along with their photos on the App. 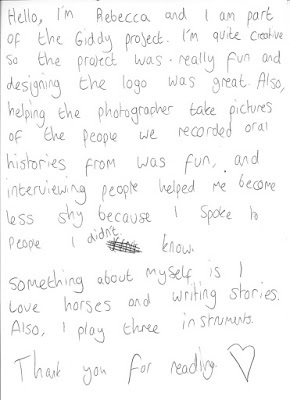 They were asked to write their name, something about themselves, something they learnt from being involved in Giddy and perhaps a stand out moment.